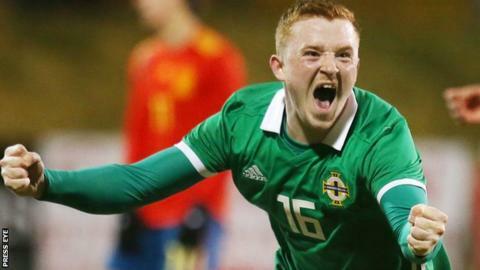 Shayne Lavery scored three minutes from time as Northern Ireland U21s defeated Mexico U22s 2-1 in a friendly in Spain. Pablo Lopez put the Mexicans in front and David Parkhouse levelled before Lavery's late winner. Mexico had a player sent off at 1-1 and they finished with nine men when another was dismissed in added time. It makes it two wins in three days during a training camp, with Everton striker Lavery also giving the team victory over Bulgaria. It is also a fifth straight win for Ian Barraclough's side as the team prepares for the Euro 2021 qualifiers, which begin in September.